Open from 11:00 Saturday, March 27 till 5:00am the following day! Open from 11:00 Saturday, March 27 till 5:00 a.m. the following day! A small gift will be presented to all visitors after 20:00, Saturday, March 27. In this exhibition, we present a total of 109 drawings, photographs and documentary films of Christo and Jeanne-Claude's projects that show the trajectory of their activities and reveal the process of bringing colossal projects to reality and the passion for beauty that lies at their foundations. Through this exhibition, we create an opportunity for people to experience their LIFE=WORKS=PROJECTS, replete with surprise and powerful emotion. Christo was born in the town of Gabrovo, Bulgaria on June 13, 1935. Jeanne-Claude was born in Casa Blanca, Morocco to French parents on the same date. After graduating from the National Academy of Arts in Sofia, Christo defected to Paris in 1958, met Jeanne-Claude in the autumn of the same year and they soon began creating unique works of art together. In 1961 they began temporary, outdoor site-specific art projects such as the Dockside Packages at Cologne Harbor in Germany. They moved to New York City in 1964. In later projects they often used cloth to transform urban and suburban scenery. Christo still devotes himself to the completion of these two projects in spite of the sudden death of Jeanne-Claude on November 18, 2009. 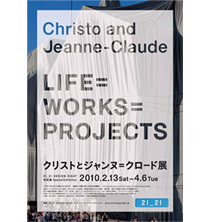 Special programs to help you gain an even deeper appreciation of Christo and Jean-Claude. Exhibition director, YANAGI Masahiko, holds a special gallery talk. YANAGI relates stories and anecdotes from the 25 years he has spent working with Christo and Jean-Claude. He will also be happy to answer questions from participants. The Gates was a project that took 25 years of negotiations to achieve. When it was realized, in February 2005, it transformed New York City’s Central Park. This is the first screening in Japan of the film that documents the project. Exhibition director, YANAGI Masahiko, who spent 25 years working with Christo and Jean-Claude, will give an accompanying commentary. *Information regarding reservations and other details will be uploaded to the 21_21 DESIGN SIGHT official website. Christo appearance from his studio in NY via Internet.